This Help Article is aimed at account Administrators setting up Happy Inspector specifically for their ingoing inspections. For our more general and comprehensive guide to setting up your Happy Inspector account, including getting your team ready, setting up your company and team accounts, please spend some time going through our Happy Inspector Setup Guide. The main thing to keep in mind while getting your account setup for your ingoing reports is that there are number of parts to Happy Inspector which each need to be configured separately. And the way that you will want to set them up depends entirely on what you're looking to get out of Happy Inspector and how you use the final product, the report. The main parts are, the templates, the reports type and the report settings. Getting each of these parts right for you requires some experimentation and playing around with your account. Don't worry, you won't break anything, and if you run into any trouble at all, please reach out to our Support team at support@happy.co for further help. The other thing to remember while reading this is that a lot depends on the unique way your office prepares reports. Whichever way suits your workflow, every office prepares reports the 'right' way and Happy Inspector should be flexible enough to meet your needs. Again, after going through these articles, you still have questions, please reach out, we'll be more than happy to help you get setup! We've prepared base templates based on generic ingoing condition reports. For some countries as well, we've based our templates on state tenancy-tribunal forms. Make sure you copy the relevant template from our Template Library into your Happy Inspector account. Next, make sure the rooms and items in your template match your workflow. Note, here we're talking about the structure of your template, not the boxes which get marked Yes or No in your inspection. These are your Rating Sets and they are independent of the structure. Rating Sets are discussed at Step 4 below. While editing your template note that, if you find yourself adding multiple bedrooms or multiple bathrooms or multiple any room, we strongly encourage you to make use of our Template Outlines feature which is a super handy way to setup one base template for any number of property layouts. 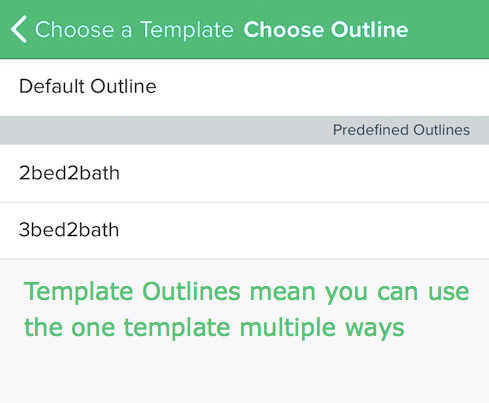 With Template Outlines, if you ever want to change your template you only need to do it once, not across multiple different templates. right after you've selected your template. Template Outlines are covered in this Help Article Templates: Outlines as well as the Help Article on Templates linked above. You may have ingoing forms you use now which have small items that need to be included as part of an inspection, for example meter readings. If they aren't on your template already, you can include these as an Overview field in your template header at the top. In contrast if you need a section to write longer, summary paragraphs, such as notes about maintenance, these can be included on your template in a Summary field at the footer of your template. Note: if you want to include text in your final report along the lines of a disclaimer or important paragraphs a state regulator requires you to include in all of your reports, see the Part 2 of this Use Case for our discussion of our Report Settings for a discussion on the Report Disclaimer text. While you're setting up your templates, it's important to be aware of how the different fields you're creating will look in the final report. In the images below, the different sections of a template are shown with how they look like in the final report. Finally, after you're happy with the base structure of your template, you'll need to ensure the rating sets in your template are right for your office's reports. Like the rest of our templates, ratings are highly configurable. Combined with the way different ways they can be displayed on your reports, you should be able to produce a report that matches your needs. For example, some of your templates include a rating checkbox which includes something to the effect of: 'Tenant Agrees Yes/No'. This does not need to be marked during your inspection and has been included for completeness and to enable offices which print final reports, a space for tenants to indicate their agreement with the property's condition by writing a 'Y' or checkmark. Your office may want to add/modify the ratings which are included in the standard Rating Set and these can be done, in bulk, on our web Template Editor.